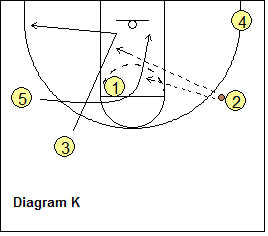 Basketball Offense - 2-3 High Patterned Offense - "White"
We like to run our "White" offense against teams that are bigger, taller inside. 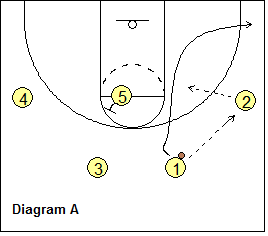 This high 2-3 offense takes the opponent's big defenders outside, away from the basket, and allows us to attack them with our speed and quickness. 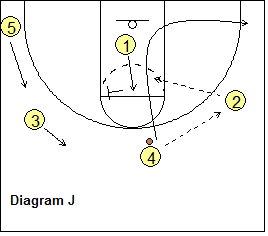 This is a man-to-man offense and looks a little like the Princeton with the 2-3 high set, but instead is a patterned offense with continuity. 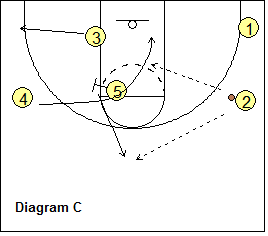 Scoring options come off screens and open cutters. A "pattern" implies predictability and the defense will begin to expect certain movements, passes and cuts and will then often "cheat" and deny or overplay. This offense has counters for defensive overplays. Often scoring occurs by reading and attacking an overplay. We don't believe in running a pattern just for the sake of running the pattern... it's all about getting a good shot. Players have the freedom to break the pattern whenever they feel they have a great option, mis-match or counter to an overplay. 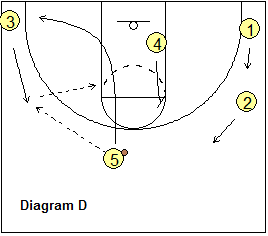 And, if the pattern is broken, our point guard simply yells "play!" and we'll go back into our familiar 4-out motion offense. Diagram A shows the 2-3 high set with two players on top and three players at the level of the free throw line extended. This takes the opponent's taller post defenders up away from the basket. O1 starts the offense with a pass to the wing O2. O1 cuts through looking for the "give and go" pass from O2, but if no pass, cuts out to the right corner. 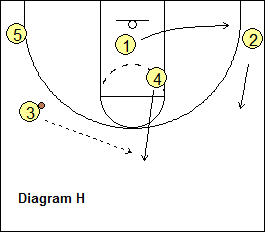 O5 at the high post becomes a screener, first back-screening for O3 at the top (diagram B), and then for the opposite wing O4 (diagram C). O5's screen for the wing O4, could actually occur in the paint, as X4 may be there in helpside. Either O3 or O4 could be open for a pass and lay-up. If O3 does not get the pass, he/she cuts out to the left corner. 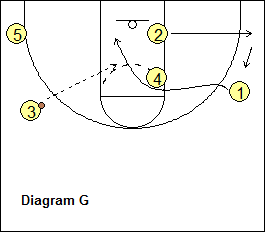 If O4 does not get the pass on the cut, he/she will pop back up to become the next high post player, while O5 pops out on top to receive the pass from O2. Now the pattern continues on the left side (diagram D) with O5 passing to O3. O5 cuts through looking for the give and go pass. If the pass is not there, O5 moves out to the left corner. O2 cuts off O4's back-screen (diagram F) looking for the pass from O3... if not there, O2 moves out to the right corner. O4 next screens for O1 (diagram G) and O1 cuts around the screen looking for the pass from O3. O1 moves out to the corner as O2 rotates up to the wing. Next, O4 pops out on top for the pass from O3 (diagram H), and the pattern continues with continuity. 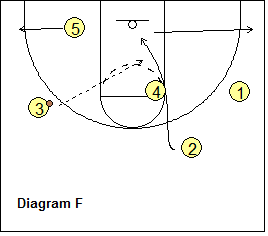 O4 passes to the wing O2 and basket-cuts (and could post up) and moves out to the right corner. O3 cuts off O1's back-screen (diagram K), followed by O5's cut around O1's screen. You can see the pattern repeating from side to side. Hopefully by now, we have already gotten a good inside shot. Defenses will try to disrupt the pattern with one or some of the tactics listed here, so you must have the counters. Many of your scoring opportunities will occur off the reads and counters listed above. In summary, this patterned high 2-3 man-to-man offense will help you against taller, bigger teams by getting their "bigs" away from the basket. 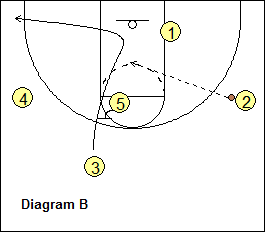 We run the pattern to get an open shot, while exploiting overplays and inside switches. We are not overly compulsive about running the pattern ad nauseum, as we look to score at the first opportunity. If you watch a great team like Wisconsin men's team run their patterned offense (Coach Ryan's Swing offense), they do not always stick tightly to the pattern, but make reads and counters on the fly. If you didn't know the pattern, you might not even realize that they run a patterned offense. Similarly with this offense, we want our players to "play basketball", and if after several cuts in the pattern, the pattern falls apart, we have no problem just running our 4-out offense. This pattern just helps our smaller players get some inside shots, and gives the defense something to think about.